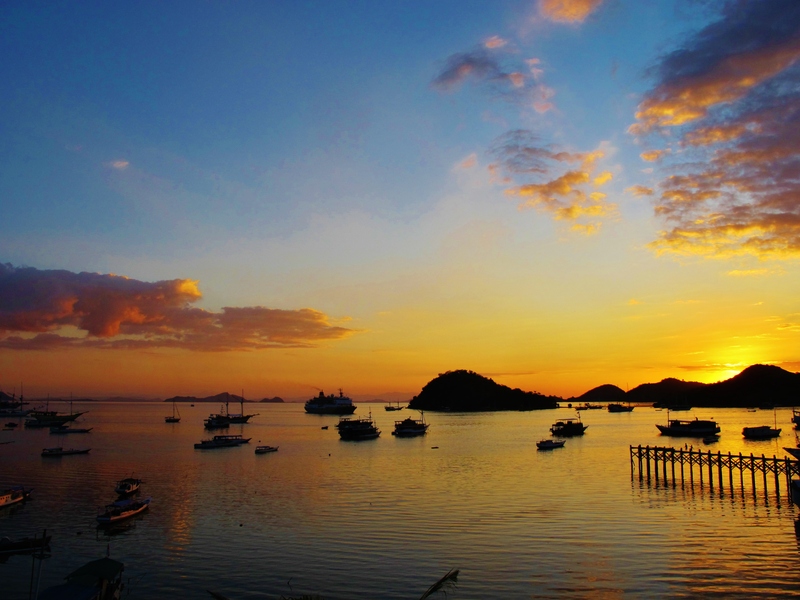 Sunset at Labuan Bajo, west Flores’ port town and the ideal dropping-off point for Komodo boat trips …. the area around the town also offers some good birding. Just east of Bali is the famous – or at least, famous among birders – “Wallace’s Line”. Bird species on islands to the east of this line have more in common with those in Australasia, whereas many of the birds on islands to the west (Bali and Java) are shared with south-east Asia. The distance between Bali and Lombok is only about 35km, but for more than 50 million years this deep water channel between the Asian and Australasian continental plates formed a daunting barrier that few species of birds – and even fewer mammals – were able to cross. It is remarkable how many bird species’ ranges extend as far east as Bali, or as far west as Lombok, but do not cross the gap. Flores lies well to the east of Wallace’s Line, and as this was my first visit to this faunal region, it presented an opportunity to see quite a few new birds for my list. For the first couple of nights, we stayed in the small, dusty and friendly port town of Labuan Bajo. This is the epicenter of the developing tourist industry on Flores. The town has a shiny new airport and several new midrange hotels, and tourism will no doubt take off here in the next few years. For now, the town is at that perfect point where fairly decent infrastructure exists, but it still receives only a tiny fraction of the number of visitors of better-known Indonesian holiday locations. Labuan Bajo is an ideal springboard for diving and snorkeling trips to offshore islands and reefs, as well as boat trips to the Komodo National Park. I birded on several early mornings on the outskirts of Labuan Bajo, ranging as far south as the river mouth, which was probably a splendid complex of impenetrable mangroves until recently but has now been heavily degraded, with dirt roads deep into the area and some kind of mining going on. A welcome sight in the mangroves was a Stork-billed Kingfisher, and hopefully some other interesting species also hang on here despite the disturbance and habitat loss. Common species throughout the coastal strip included Flame-breasted Sunbird, Wallacean Drongo, Yellow-spectacled White-eye, Black-faced Munia, Zebra Finch, Sunda Pygmy Woodpecker, Sacred Kingfisher, Barred Dove and Black-fronted Flowerpecker – almost none of these birds can be found to the west of Wallace’s Line so most of them were new for my list. Truck trail through degraded mangroves south of Labuan Bajo. The local birding highlight was a splendid Elegant Pitta, which I spent some time stalking in a wooded gully on the edge of Labuan Bajo, before it finally gave itself up for good views. Many species of pitta are maddeningly elusive, able to disappear almost into thin air; they tend to frequent dark areas of the forest floor and can slip away undetected even when you think you’ve got their location pinned down. So the satisfaction levels are high when you finally connect with one. I also had an unexpected Australian Pelican soaring offshore one evening. This is an uncommon visitor to eastern Indonesia during the southern hemisphere winter, and as with all pelicans is a spectacular sight. There are two well-known birding locations near Labuan Bajo that can be reached by scooter or even public transport. The first is the forested hill around the Puarlolo communications tower, about 50 minutes scooter ride east of Labuan Bajo. The site is easy to find as there is basically only one main road out of Labuan Bajo which passes right below the tower after about 38km …. but be wary of the smaller but similar tower a few kilometers before it. The “real” tower is on the right hand side of the road, and there is a billboard with pictures of endemic birds shortly before it. This is one of only a handful of known sites for Flores Monarch, which can be elusive although it is probably fairly common in the area. I had a very frustrating morning at this site. First of all, I walked the short approach road up to the tower, which produced Crested Dark-eye, and several singing Russet-capped Tesias which unfortunately I could not get a visual on. Next, I returned to the main road and walked a few hundred meters back towards Labuan Bajo. Behind a newish building on the left, a narrow trail leads into the forest. This trail proved to be a singularly frustrating experience as I saw almost nothing in there. The habitat looks good but the vegetation is very dense, and although I heard many birds I didn’t get tickable views of anything much at all, apart from an Asian Paradise-Flycatcher that approached me so closely that it almost seemed to be mocking my lack of success. I had much better success at the “other” famous Labuan Bajo birding site, although my expectations for this place were somewhat lower. This is the road to Rareng, also known as the Potowangka Road. I had to check Google Maps carefully for its exact location, as it’s not signposted – look for a surfaced road on the left, in a village about 10km from Labuan Bajo, shortly before the main river crossing. 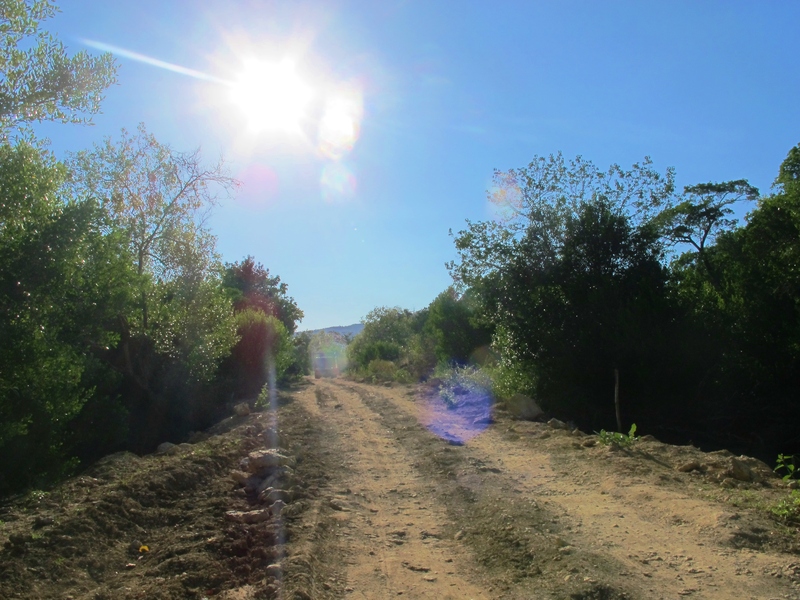 This minor road winds its way slowly uphill through degraded lowland forest, and continues for many kilometers for those with the inclination to explore, although most birders seem to focus their efforts on the area between 3 and 7km from the main road. Recent trip reports indicated that this road is now quite busy with traffic, making birding difficult. It is also clear that the quality of the habitat has been much reduced in recent years – there are piles of trash here and there, and I saw several hunters with guns entering the forest, although thankfully much of it still remains inaccessible because of the lack of trails. I arrived at the site at first light on a Sunday morning. At first I was pleasantly surprised at how little traffic there was along the road, at least for the first couple of hours. One annoying factor in this part of Indonesia is the “friendliness” of the people – in other words, every passing truck or motorcycle will sound their horn, and the driver will invariably shout or wave when they see you. So much for quiet undisturbed birding. At one point I tried to hide in the bushes when I heard a bus loudly approaching, but I was spotted and the bus even reversed so its occupants could have a close look at me and shout out their greetings as I slunk shamefully out of my hiding place. I walked about 3km along the road, and although birds were fairly scarce it was definitely a case of quality over quantity here. My favorite bird here was a beautiful White-rumped Kingfisher, perched in full view not much higher than eye level among the trees. This is an unusual kingfisher, an endemic to Flores, and sometimes it can be a tough bird to find. I also had good looks at a pair of Flores Crows, a shy jungle crow with rather odd vocalisations that is now endangered due to loss of habitat. I was also lucky to connect with Wallace’s Hanging Parrot, arguably THE speciality of this site, but as is typical with hanging parrots my views were of the in-flight-overhead-calling-loudly variety. I had much better views of several pairs of Flores Minivets, a singularly attractive member of a very attractive bird family, made all the more satisfying because it is a Flores endemic. Labuan Bajo Area Lifers: Flame-breasted Sunbird, Rusty-breasted Whistler, Spotted Kestrel, Wallacean Drongo, Black-faced Munia, Yellow-spectacled White-eye, Sunda Pygmy Woodpecker, Zebra Finch, Barred Dove, Indonesian Honeyeater, Elegant Pitta, Black-fronted Flowerpecker, Crested Dark-eye, Australian Pelican, Arafura Fantail, Flores Crow, Flores Minivet, White-rumped Kingfisher, Wallace’s Hanging Parrot. Labuan Bajo Area 2015 Year Ticks: Sacred Kingfisher, Brown-throated Sunbird, Little Black Cormorant.